Never before has technology been so prevalent in everyday life. The bewildering fast-pace of change and innovation has fuelled remarkable growth in the high-tech sector, calling for up-to-speed and in-depth understanding of the multiple issues involved at all stages of the business life cycle. Our location in central Cambridge – arguably the UK’s leading high-tech city – has given us significant exposure, which has in turn developed into advanced experience, in this sector. We are in a prime location to service the many high-tech companies on our doorstep and in the surrounding ‘silicon fen’. The nature of ‘high-tech’ has created a very dynamic environment for businesses in Cambridge. We have extensive experience in translating ideas into start-ups, assisting in raising investment and providing tailored advice every step of the way as sale to larger multinational corporations take effect. We can, and do, help at every stage of the process. The high-tech sector is vital to the long-term success of the UK economy. This is recognised by the government in the form of grant funding and some generous tax reliefs to encourage investment in start-ups and small unquoted companies as well as to assist investment in to Research & Development – schemes which seem to be playing an increasingly vital role in supporting the UK’s booming tech sector. Grants represent a core area of funding for many high-tech businesses. Not only can we assist in the grant application process, with preparation of cash flow forecasts and budgets, but we also have experience acting as auditors – verifying to the grant-giving body that the money has been spent in accordance with the grant application. Another source of assistance comes in the form of ‘Knowledge Transfer Partnerships’. This is promoted by Innovate UK (formerly known as the Technology Strategy Board) and is a scheme to create collaborations between UK businesses and universities. We can help clients who need either third party investment or funding from lenders, by assisting in the preparation of business plans with the required budgets and cash flow forecasts. As technology companies now represent a large proportion of those employing schemes such as the Seed Enterprise Investment Scheme (SEIS) and the Enterprise Investment Scheme (EIS), our specialist knowledge in the high-tech sector has had the knock-on effect of developing expertise regarding these two tax efficient means of securing investment funds. The EIS is intended to help small unquoted trading companies to raise finance by encouraging individuals to subscribe for shares on which they will receive various tax reliefs, such as income tax relief equal to 30% of the sum invested in addition to various CGT reliefs, loss relief and exemption from Inheritance Tax, subject to certain qualifying conditions. The SEIS is similar to EIS but geared towards start-up companies, offering an even more generous income tax relief equating to 50% of the invested amount. Schemes such as these can therefore help start-ups as well as more established companies to access the right investors and provide much-needed funding that is not readily available from banks. However, as an ever-increasing number of companies reach to these schemes to obtain tax efficient business finance, the demand for niche technical expertise also increases. Our collaboration with leading London firm of EIS Fund Managers, Thompson Taraz, meets this demand by providing clients with advantaged access to experts in Independent Fund Management and Consultancy – highly specialised fields generally not offered by mainstream accountancy practices. 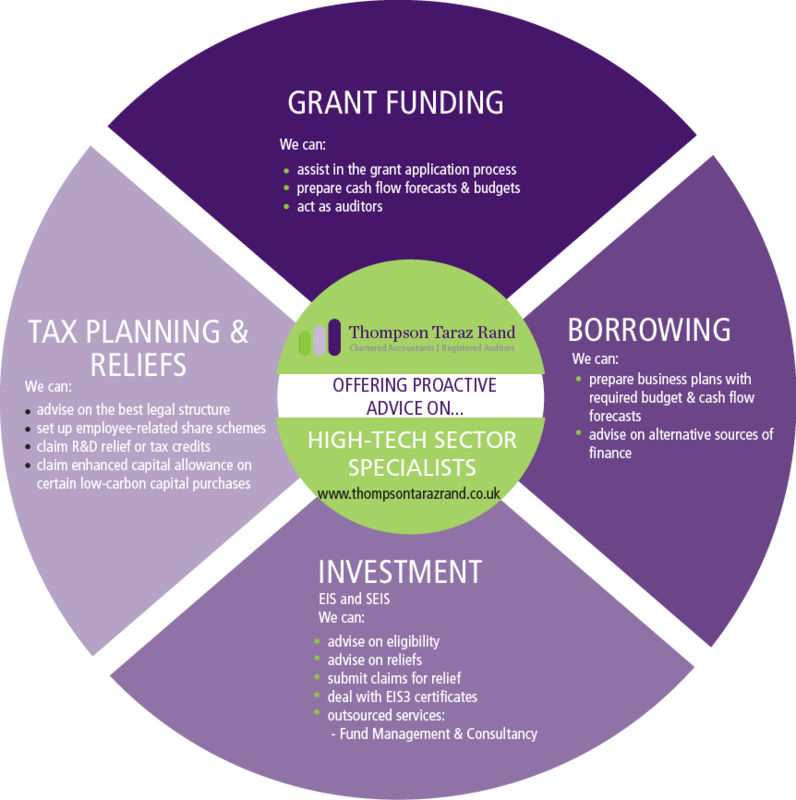 Thompson Taraz have helped some of the UK’s leading alternative investment fund providers to bring their projects to fruition, confident in the knowledge that financial, taxation, legislative and relationship communication with investors is being handled by a specialist. Although EIS Fund Management is therefore an outsourced service, our alliance with Thompson Taraz ensures this is provided in a seamless way. Experience has shown that we are able to add most value in the tax planning process if there is clear dialogue between us and our clients so that we can understand their business as well as short, medium and long term goals and objectives. Please see our Tax Services for Business page for further information.